I happened to be near the Art-O-Mat at the RoCo recently so I thought I see what I would get. 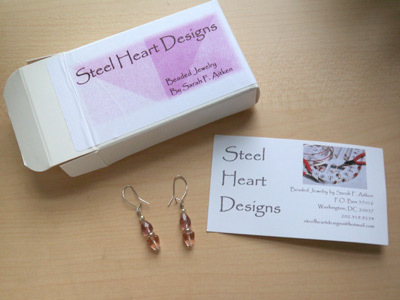 This time I got a pair of glass bead earrings. What a surprise. I love them! I love Art-O-Mat. I equally love and hate when you post about the Art-o-Mat. 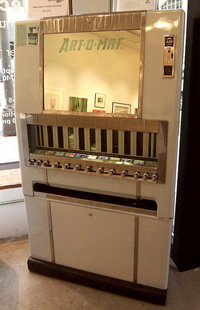 I love these posts b/c I think the Art-o-Mat is such an awesome idea. I hate them b/c it reminds me that I cannot find one anywhere! I went to their website and found where one was in Atlanta. I got there, and it was nowhere to be found. Now that I'm in Philly, I found a location here and went there and once again, non Art-o-Mat. I am determined to one day find one. Hopefully I can remember to stop by the one you went to the next time in Rochester. I know that if I lived anywhere near one of these I would be filling it with money. OMG that is the coolest thing ever!!! I wish we had them here!! anonymous... send me an email and maybe we can work out a mail exchange and I can send you some Art-o-mat stuff. walnut - I checked out your blog and you are an awesome scrapbooker!